Running a business can feel really overwhelming sometimes. Don't get me wrong, being your own boss is awesome but a dream job is still a job and it still has its own stressors, anxieties, and overwhelming days along the way too. We're in charge of everything, from client work, to customer support, marketing, accounting, and so much more. We wear so many hats and we have a whole lot of responsibility on our shoulders to show up, do the work, and keep our business moving forward each day. And now and again, it can all start to feel like a little too much. Maybe you're worried about money and overwhelmed by the pressure and anxiety that comes from being in charge of making your own income. Maybe you're feeling overwhelmed with your client workload and struggling to find enough hours in the day to get everything done. Maybe you've made a mistake or faced a setback or disappointment and you're starting to fear that everything in your business is starting to fall apart. Maybe you're just exhausted and in need of some rest but your business is demanding of you something you don't feel like you can give it right now. 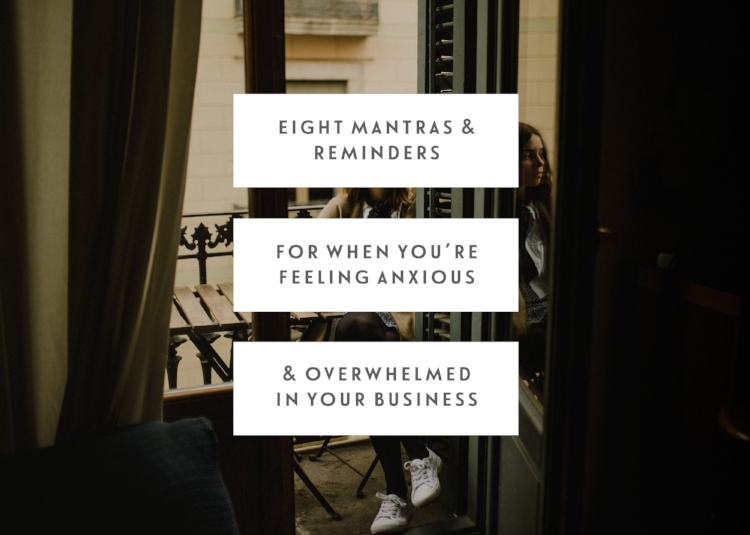 Whatever it is, I have eight mantras and reminders for you today for when you're feeling anxious and overwhelmed in your business. My hope is that these can hold some space for you to find some peace, courage, and perspective in those moments so you can continue to move forward along the way. We've all heard the saying: the only way to eat an elephant is one bite at a time, and it applies to running a business too. If you're feeling overwhelmed by all of the to-dos and tasks in front of you, just take them one task at a time. Prioritise them in order of importance, or pick one that feels easier so you can start to get into the flow of work, and just take it step by step. Remember: you can do anything and everything you want to in your business but nobody, including you, can do everything all at once. Everything you're afraid of - the rejection, the failure, the setbacks, the criticism, the mistakes, the work it's going to take - cannot hurt you. They may bruise your ego a little or eat up all of your energy and inspiration for a while, but they cannot hurt you. We have to remember that we are oh so capable of navigating any obstacles and setbacks our business may send our way. You don't have to be on top of your game every single day. It's okay if you need to slow down, rest, recharge, or reconnect to your core values and vision from time to time. It's okay if you make a mistake - it's how you fix that mistake and take responsibility for it that matters most. It's okay if you don't reach all of your goals or feel super productive every day - you're a living, breathing human being and imperfection is just part of who we are. But being messy and imperfect doesn't mean that we're not also worthy and capable of making incredible things happen along the way too. Nothing works if you don't work, and we can only do so much on an empty tank. You have permission to take damn good care of yourself - to nurture your mind, body, and creativity every step of the way. Because that's where your very best work is going to come from, and that's exactly what you, your clients, and your customers deserve - the very best work that you can do. Whenever I'm feeling extremely anxious in my business I like to play the worst case scenario game. For me, my biggest and greatest fear is that I won't be able to provide for myself and my little family and that we will one day be without a roof over our head and food on our table. It's an irrational fear in many ways, as my business has been thriving for years now, but it can still haunt me from time to time. I see so many of my clients battle with this too, with navigating their deepest fears and worse case scenarios while they're working hard to bring to life the creative work and life they've been aching for. So I encourage them to play the worst case scenario game too - to get super specific on what actually would have to happen for their worst case scenario to become a reality. And what we always see is that there are always so many steps ahead of them before their worst care scenario would happen, and that our worst case scenario fears are almost always a little irrational too. Facing our deepest fears head on can help us to see that they're not as scary as we thought they were, and empower us to move forward with more courage and tenacity too. There are always people in your corner rooting for you - whether it's family and friends, peers and co-workers, mentors, coaches, and therapists, and members of your online community too. If you're struggling, you don't have to go through it alone - you can reach out, ask for help, and find the support and encouragement that you need. We are not stronger or better business owners if we fight our battles alone - we're allowed to be vulnerable and share our fears, anxieties, and struggles with others when we need and want to. Think about everything you've built and achieved so far, all of the mountains you've climbed in your business and creative life, and how much you've grown, evolved, and developed as a business owner too. Whenever I spiral into anxiety in my business, this is the mantra that helps me the most - I trust myself, and I trust my business. I trust all of the work I've done so far to get me here, I trust myself and the decisions I make in my business, and I trust that I will be able to navigate whatever comes my way next too. Being a business owner is hard, and scary, and lonely at times too. There's a whole lot of pressure on our shoulders each day, and we have a whole lot of responsibility to ourselves, our clients, our customers, and any employees and collaborators we may be working with too. By building a business from scratch we've already done something incredible, and all we can ever truly ask of ourselves is to do the very best we can. To show up and give our work and our life 100% in whatever way that looks like each day - because sometimes that may look like ticking off all of those to-dos, and sometimes it looks like resting and refilling our tank too. Running your own business can feel like an emotional rollercoaster at times. Some days you may feel like you're on top of the world, and other days you may feel overwhelmed with anxiety and stress. But you're never alone, there are crazy-awesome creative business owners just like you out there right now navigating the same types of highs and lows and ebbs and flows along the way. The fact that you've built this business from scratch and continue to show up for it each day is something to be oh so proud of, and I see time and time again through my work with my awesome clients that we are all so much more capable than we ever give ourselves credit for. I'll be rooting for you always! Every Sunday I send thoughtful insights to my community through Weekly Letters. If you're not already on the list, you can sign up below to receive the next letter straight to your inbox.